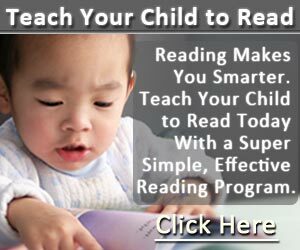 Have you ever heard or read that learning phonics is an effective way for a kid to master reading? Perhaps you are already thinking how you can teach your child phonics. When my niece was six years old, her kindergarten teacher advised my sister to send my niece to an enrichment phonics class. She was hoping that my niece could learn to read as she was falling behind in her reading. My sister did. During those days, I was staying with my sister’s family. Once while we were at home, I started to hear my niece go, “Fuh-fuh-fish!” I was puzzled with the noises she made and my sister enlightened me that my niece was practicing her phonics! That was my first encounter with a kid demonstrating phonics practice to me. A thought was formed in me. In future when I have a child, I too intend to send my kid to a phonics class. When he was about 17 months old, the creator of Children Learning Reading program shared with me that though my son might be too young to start on his reading program, it wasn’t too early to start him on building up his phonemic awareness skill. Phonemic awareness is where a child learns about the smallest units of sounds called phonemes, and this skill would go toward helping a child learn to read in future. It has been said that it is more important for young children to learn letter sounds than letter names because mastering letter sounds will go toward helping the child to decode words and blend letter sounds together to form words. So I began to see the importance of learning letter sounds the phonics way. That started the journey of me helping my son to develop his phonemic awareness skill. As he was merely a toddler, the best way to teach him was through informal instruction that involved what he did best, fun and play! I began to incorporate letter sounds games and activities into his daily routine. By two years and three months old, my son’s phonemic awareness skill was solidified and I started him on his toddler reading program. I’ll share with you two simple ways that you can use to help your child develop phonemic awareness. My friend bought a LeapFrog phonics toy for my son when he was merely six months old. It was much later that he learned to play with this toy which introduced him to letter sounds, letter names, and the alphabet song. It also helped to train his fine-motor skills, as he had to manipulate the letter tiles to insert a tile into the reader unit correctly to play a catchy tune about that letter name and sound. You can read my review of LeapFrog Phonics learning system to find out how their toys work to teach kids phonics through play. In your normal conversation with your child, intentionally stretch out a word or two in your sentence. For example, “Do you want to dr-ink m-ilk?” Let your child understand that words are made up of letter sounds. You have to sound out the stretched words clearly and distinctly. At first, your child probably won’t catch on. It may take awhile for her to grasp the concept that letter sounds are combined together to form words. Some children will grasp this concept fast, while others will take a longer time. It could be weeks or even months before your child catches on the concept of oral blending of sounds to form words. Have patience and continue on with this activity. Keep finding opportunities in your every day talking to your child to introduce phonemic awareness. The key to teaching young children is repetition, consistency, and patience. Alternatively, you can play the single word game with your tot or preschooler. Sound out a word slowly and ask if your child can get it. Keep this pre-reading activity short, about 5 minutes.That was what I did with my son when he was younger. I realized that after he has mastered his letter sounds, he could do his single word game very well! I hope that these methods will let you have fun with your child and at the same time let him build up his phonemic awareness skill.